The title of this post might seem a little confused. A true Spanish tortilla is made with sliced potatoes and eggs. You may or may not add onions and on occasion you might see some chorizo, peppers, peas or bacon thrown in. So whilst I have made a ‘true’ tortilla, I have also broken the rules by adding slices of black pudding. I have made ‘tortilla’ in the past and I had thought that I was doing them right. Having never followed a recipe, I thought you just boiled your potatoes and chucked them in with the egg and fried it all up. But it would appear that method is not quite right. So I read a few recipes and an article in The Guardian on The Perfect Spanish Omelette, and it became clear that the potatoes needed to be sweated in copious amounts of olive oil to cook. To be honest, I initially thought this crazy….not only a waste of oil but also an unnecessary boost in calories. Needless to say, I decided I had to do it the apparently proper way. After all, I had some very special black pudding from my friend Louisa who has a local organic pork farm. Her pigs are the rare breed of Noir Gascon – gorgeous looking creatures – and they provide some of the most flavoursome pork I have ever tasted. Check out their Facebook page here if you want to get your hands on some. So I was pretty excited to be playing with some of her black pudding. And it occurred to me that a Spanish tortilla would be pretty good with some rich, peppery black pudding nestling between the tender potatoes and soft eggs. Erm, yes please. What I discovered is that this somewhat longer and more exact process of making Spanish tortilla is worth every last single extra second. It really did make the potatoes softer, silkier and just all round better. It tasted just like an authentic Spanish tortilla that you might devour anywhere in sunny Spain. And the treasured black pudding strewn within it was just lovely. Not too rich, very well balanced and adding another peppery dimension that was a real treat. So, what I have learnt from all this is that you must make your tortilla in the true Spanish way and then break all the rules and throw in some black pudding! 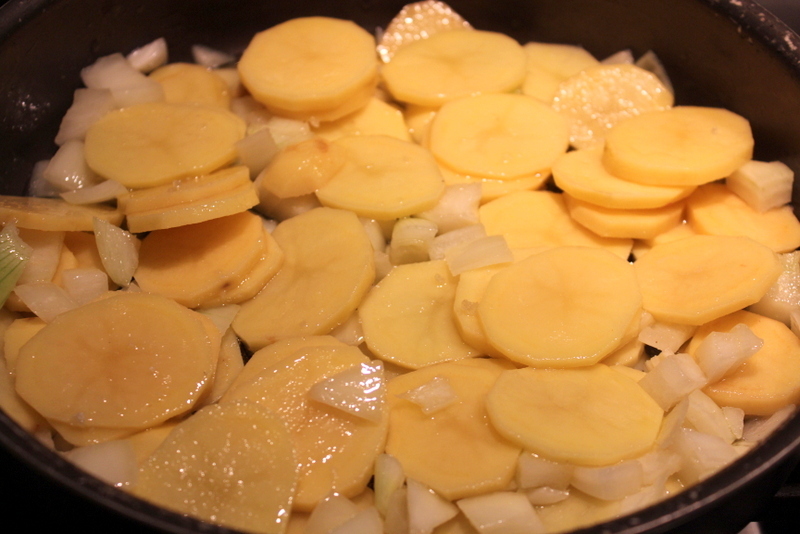 Heat the olive oil in a pan over a low heat and toss in the potatoes and the onions and season. Keep the heat low, partially cover them and let them sweat in the oil for 20 – 30 minutes – it really depends on how low you can keep the heat. Just braise them until they are cooked through and nearly falling apart but don’t let them get brown or crispy. 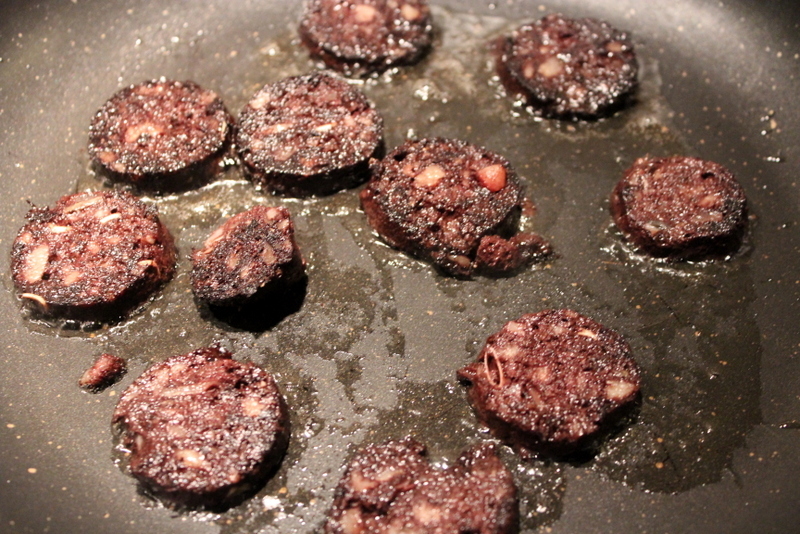 Meanwhile, heat a little olive oil in a non stick pan and fry your black pudding slices for just 2 minutes each side. They will colour and cook quickly. Remove, drain and keep to one side. Once the potatoes are cooked, drain them, reserving the oil for use now and in the future. 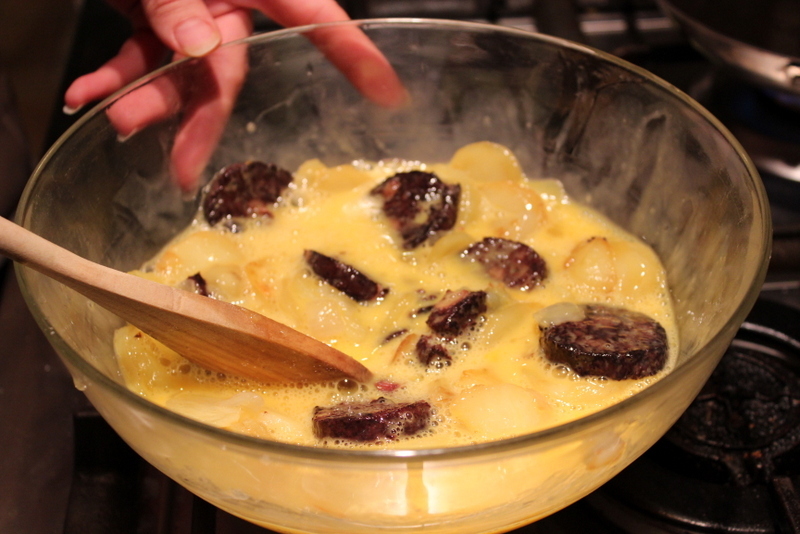 In a large bowl, mix together your potatoes, black pudding and beaten eggs. Use a good tablespoon of your drained reserved olive oil and heat in a tortilla pan (mine is 20cm) then add your egg mixture, and cook on a medium heat for 4-5 minutes. It should be cooked at the edges and nearly set on the top as below when you need to flip it. Then take a plate and invert the tortilla on to it and slide it back into the pan to cook the other side for 3-4 minutes. Leave it to stand for 10 minutes before serving. It’s lovely hot or cold. 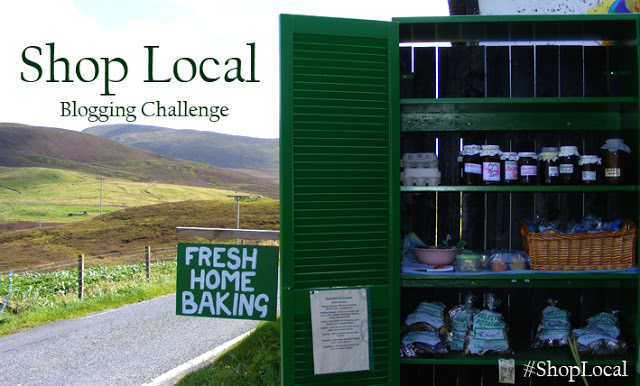 Also, I can add this to the Shop Local Blogging Challenge hosted by lovely Elizabeth from Elizabeth’s Kitchen Diary as the fabulous black pudding I used was sourced locally from my friends certified organic farm Enjouanisson. 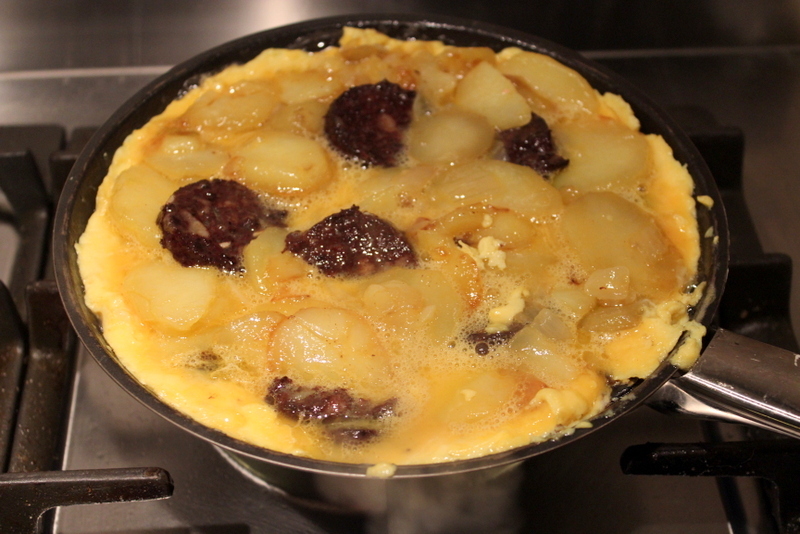 24 Comments on "A True Spanish Tortilla (with Black Pudding)"
That looks SO good. I love the addition of the black pudding and that does look like a very fine black pudding. Gosh, I didn’t know Spanish tortillas existed. I thought all tortillas were like the Mexican kind- thin and made of either corn or flour. Living near the Mexican border for the past 5 months, I’ve been eating tortillas almost every day. Good to know I can now progress to the Spanish kind! Yummy! I don’t like black pudding, but this tortilla looks so good. Maybe I’ll replace the black pudding with sausages. Interesting I know I’ve never made an authentic tortilla either, always adding way too many additional ingredients. I tend to make them as a way of clearing out the fridge of cold cooked potatoes and miscellaneous cooked veggies, plus a little fried onion and pepper and sometimes a few slices of chorizo. Hardly authentic. But I’m betting your true tortilla with glorious local black pud was heavenly….all that olive oil, it would have to be! Seems like I’ve been doing the cheat’s version of tortilla too all this time! Next time I’ll definitely be sweating the potatoes in olive oil for a good long time first, as yours does look so good. And I really like the idea of using black pudding too. I’m a massive black pudding fan! That is combing two of my favorite breakfast items. I ate Spanish tortilla every day for breakfast while in Spain last fall. And I absolutely love the Irish breakfast “Fry” with eggs, black pudding, white pudding and rashers. Delish! I could eat tortilla every day in Spain too!! It’s so good and an absolute must have for tapas. You are right I think that this version with black pudding would make a perfect hearty breakfast or brunch. Love the slow cooking of the potatoes and I do think you can tell when this has been done properly, it really is worth doing, I agree I have become more of a fan of black pudding recently and would love to have it in a really tasty meal like this. I love eating tortilla with my home made hot chilli sauce too! It’s good to hear that you agree about the cooking of the potatoes. And I love the sound of tortilla with home made hot chilli sauce….yes please ! It really looks like you were able to get what I consider “real” black pudding, or at least a decent hybrid. I wasn’t sure from the photo of it raw, but when it’s cooked it seems to have held its shape really well. Previous attempts at cooking French “boudin noir” in way I’d cook an English black pud (sliced up) have resulted in a crumbly mess (albeit delicious!). Great looking tortilla – I was first introduced to these wonderful things by a Spanish colleague many years ago. Hi Charles, oh yes, this was good real black pudding and I was very impressed that is held it’s shape so well when cooking. 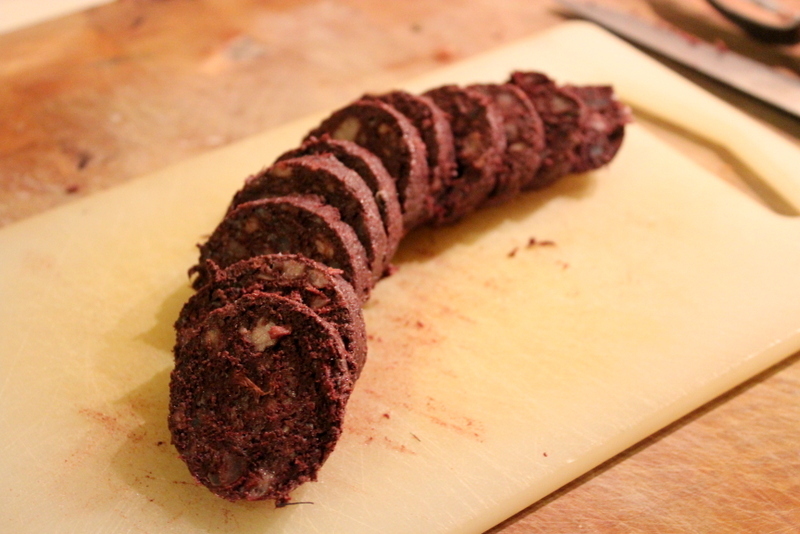 I completely know what you mean about boudin noir…it’s so tasty but quite crumbly and soft. 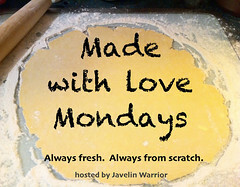 Thank you for sharing your lovely recipe with #ShopLocal and my apologies for taking so long to pop over and comment – it’s been a very busy month for me and I’m behind! 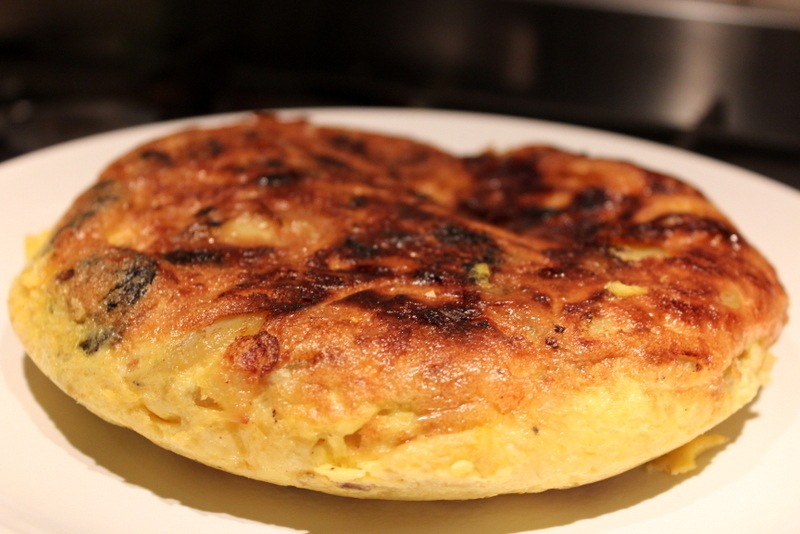 I’ve never tried a true Spanish tortilla – bookmarked!